October 27th marked two years of Casey and I being together! We've grown so much, have learned a great deal from each other, and we've created so many everlasting memories. To celebrate our anniversary, we decided to do a weekend getaway. The date was creeping up quickly, and we still hadn't decided where to venture off to. Feeling defeated, I decided to do some leisurely scrolling, and happened to come across this amazing Philadelphia Travel Guide. Within 3 days time, Case and I booked a hotel, packed our bags, and created our extensive Philly itinerary! Since we were only spending two days in Philly, we decided to get an early start and headed out on Friday morning--the day of our anniversary. Luckily for us it was only an hour and a half drive, so we got there pretty quickly and immediately started exploring. The first stop on our itinerary was Philadelphia Magic Gardens. The Philadelphia Magic Gardens is an incredibly popular art installation crafted by Isaiah Zagar. Through the use of nontraditional materials such as bicycle wheels, color glass bottles, hand-made tiles, and bits of mirror pieces, he designed this immersive gallery in an attempt to beautify and recreate the South Street area of Philadelphia. The gallery is so immersive and breathtaking--I could've spent hours wandering around in there if Case didn't drag me out. Definitely a must-see if you plan to visit Philly. Shortly after we headed to Chicks Philly, which is one of the restaurants we had on our list of places to check out. The staff is super warm and welcoming and the menu is phenomenal. I had their chicken parm sandwich while Case opted for a veggie burger. The food was seriously mouthwatering. Can "Chicks New York" like.. become a thing? After nearly stuffing our faces, we headed over to our hotel to freshen up and relax before the night's festivities. We were a little ways off from the hotel and the sun was starting to set, so we decided to rent some bicycles and ride back to the hotel--totally tourist-like but so worth it. It was such an exhilarating experience! Riding through a city that we'd never been to before was so thrilling. Our stay at the Loews Philadelphia Hotel was luxurious. Our room was on the 28th floor, so we had an amazing overlook of the city. I loved the incredible Art Deco-inspired design of the room--part of the reason why we chose this hotel. It's so modern and fresh! We started off our evening with dinner at V Street, a popular vegan restaurant with a warm and cozy atmosphere. Their menu consists of both small and shareable dishes with incredibly bold flavoring. Case and I got two orders of the Farinata, which had broccoli rabe, calabrian chile, and smoked garlic aioli spread over a chickpea pancake. Soon after, we ventured off to South Street to check out the nightlife scene. We roamed and did some bar hopping before calling it a night. We woke up to warm sunlight pouring through the window. We were leaving in the afternoon but our itinerary was far from finished. After checking out, we headed to brunch at The Ugly Duckling. Other than being known for its historical landmarks, Philadelphia has an incredible food scene. I wish we could've tried almost every restaurant on our list but hey, that's incentive for us to make multiple trips back! I had their cookie dough pancakes. (Still drooling over this plate, btw). 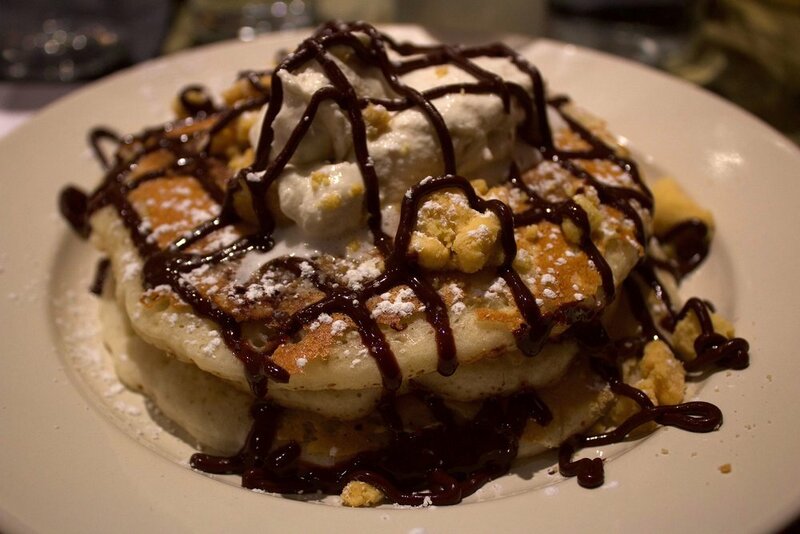 The pancakes were hot and fluffy with chocolate drizzle, whipped cream, and huge chunks of cookie dough. Needless to say, I soon fell into a food coma while repeatedly telling myself that a trip to the gym was immediately required. After brunch, we had planned to do some historical sightseeing at Elfreth's Alley, which is the oldest residential street in all of the United States. Unfortunately, there were a few parades and events going on, so with all of the detours and traffic it was hard for us to get there. Again, more of a reason for us to make a return trip! I was able to get some shots through the car window though--the homes and buildings that lined the streets were so beautifully designed with both historic and modern architecture. Of course we couldn't dip out of Philly without checking out the skate scene, so it was a must for us to stop at the infamous FDR Skatepark. Case was like a kid in a candy store. He shredded for a bit while I stood off to the side, recording and cheering him on like a proud, cheesy girlfriend. If you're looking for a quick getaway, whether its a weekend or just a day, I sincerely recommend a trip to Philadelphia. I found most of the activities we did to be relatively cheap, if not free! 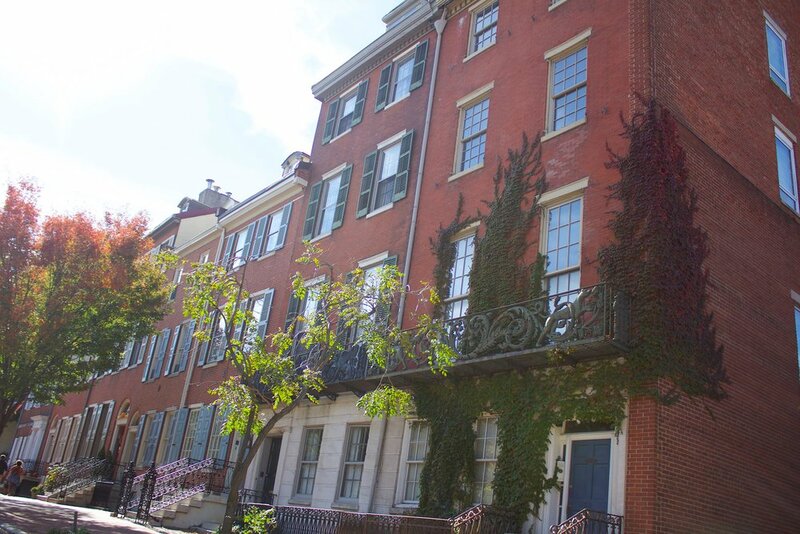 Philly has so much to offer from its historical landmarks, to its restaurants, museums, and so on. Case and I both agreed that a weekend wasn't enough time for us to see and do all that we wanted, so a second getaway is definitely in the works. Being that we both spend so much time in Manhattan, it was definitely fun and interesting to get a taste of what another major city was like. Hope you all enjoyed!